BELFOR I bought this vase from Canada. 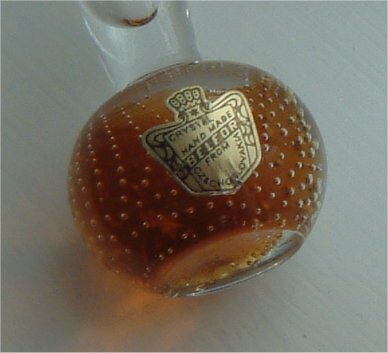 The label has a metalic gold background with black lettering with the words 'CRYSTAL HAND MADE BELFOR FROM CZECHOSLOVAKIA'. I believe it was made for Belfor & Co. Ltd. Ottawa, ONTARIO. Perported to be Canada`s largest distributor of Bohemian glass. It is approximately 205 mm tall. The base is concave, the bubbles are small and come up in a slight spiral. The core is an orange/amber encased in clear glass. 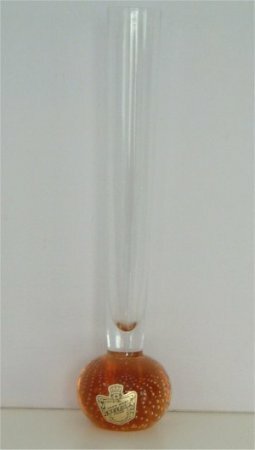 The stem is clear glass and has a medium flare being 25mm in diameter at the top.